Building on his 1001 Movies You Must See Before You Die, Steven Jay Schneider's editorial skills come to the fore once again for this (semi) sequel which focuses not on the films but on those behind the cameras that make the films. A concise introduction is provided to justify the very concept, but its usefulness is undermined by the phrase 'even acknowledging the death of auteur theory in contemporary film studies...' which is really irreconcilable with the book's concentration on directors who have 'a distinctive vision...and an uncanny ability...to reveal aspects of themselves through(out) their work' (p.7). Thus, we have a book which seems to feel the auteur theory has been practically buried (rather than just placed in a home for the academically frail) yet which seeks to provide a guide to major film directors who are to all intents and purposes auteurs. Perhaps best that we regard 501 Movie Directors: An A-Z Guide To The Greatest Movie Directors as just a directory of great filmmakers after all. The layout of the book is intriguing and, I have to say, a voyage of discovery as a consequence. It is organised not alphabetically (as might have been tempting) but in chronological order of the directors' birth. Thus, little coloured markers visible along the tips of the pages demarcate each decade, allowing one to observe that the years 1873, 1874 and 1875 mark the births of Alice Guy, Fred Niblo and D.W. Griffith respectively. Each director is priviliged with full biographical details and a short piece reflecting on their directing style. The main text represents a film critic's response to that director's body of work (often citing one or two key films) and is supplemented by a list of key films (labelled 'top takes') on the right of the page (with those deemed worthy of special merit given a black asterisk) underneath a photograph of the director in question. An enlarged quotation, standing out from the main body of text, completes the framework. This isn't a greatly complicated structure, but it works superbly. The other key advantage is in its simplicity- it is easy to find what is required either by random browsing or by using the index at the front of the book to find a certain director. Particularly attractive in the make-up of each page is the photograph- stars faces are familiar to millions, even if they have never seen a film starring that actor. Directors though, by their very non-limelight role, can be overlooked. The images of the famous (Ford, Hitchcock, Truffaut) rub shoulders with the far less visually familiar (Vigo, Rene Clair, Stanley Donen). This enables each entry to make an immediate impact as the reader can relate directly to the career under discussion without it being merely a name. Predictably, any such 'list' book invites critical study as much for what is in it as what is not. Thus, as one skims through the pages, pausing sporadically to read what critic A judges John Ford's 'top takes' to be (and to disagree: as someone who has studied Ford extensively I would favour the lyrical beauty of The Hurricane(1937) any day over the quite frankly tedious The Informer(1935), one observes some bewildering omissions. Of course, when one locates such omitted talent, the question arises of what (or in this case who) could be safely removed for the inclusion of the new "find". One doesn't have to search far- do Sogo Ishii, Fridrik Thor Fridriksson, Ki-Duk Kim, Ram Gopal Varma or Gaspar Noe (to name but five to my mind dubious entries) really merit inclusion over veteran Hollywood master Irving Rapper? With a sporadic career spanning 1941-1978, Rapper is surely worthy of inclusion if only for his iconic Now, Voyager (1941). Another director who should be (but isn't) found within the pages of 501 Movie Directors is Paul Morrissey. Responsible for not only the directing but also both the writing and photography in an inspired trio of films starring Joe Dallesandro between 1968 and 1972 (Flesh, Trash and Heat), Morrissey's work with Andy Warhol should easily grant him a place in a book such as this, particularly when one considers some of the rather thin attempts to argue that some of the 'who?' directors are worthy of inclusion. Finally, the name James Parrott might elicit the very 'who?' reaction a book like this should seek to avoid, but watch Laurel and Hardy short films from 1928 to 1933 and you'll probably see his name- as cheese isn't quite the same without pickle, meat rather lost without gravy, so these Hal Roach studio shorts are unimaginable without Parrott's expert touch. However, although these three men sprung to mind fairly readily, three out of 501 isn't exactly heavy ratio- and Schneider's book does do what it sets out to do: provide an overview of most of the major directors in cinema history. Each director, no matter how meagre their film credits may be, is granted one page with the exception of the the "legends", whose entries vary. For example, Murnau gets two pages (as does David Lynch), Kubrick three (as does Godard and Hitchcock), which enables a more detailed illustrated study to take place. This balance is just about right- the book big enough to keep even the most ardent film fan quiet for several days but not too heavy for the average solidly built bookshelf. If you can look past the inclusions of directors whose work is either totally unknown in this country or totally unavailable and find your favourite lurking in the book's pages I think you'll be happy, even if the pleasure is largely in finding out exactly what Victor Sjostrom really did look like. 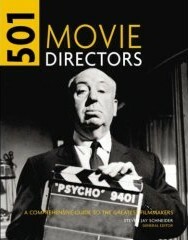 '501 Movie Directors- An A-Z Guide To The Greatest Movie Directors' is published by Cassell.